A couple of my friends and I drove up to Ashland last weekend for the renowned Oregon Shakespeare Festival. Our senior year of high school, both of the honors English classes went up to see 4 plays. We loved it so much we promised ourselves we would go back, and after two years, we finally did! Unfortunately, we only got to see one play (and it was not one of Shakespeare's) but it was very good. It's called The Clay Cart and it's about a man and a courtesan who are in love but the king's brother-in-law wants the courtesan for himself. Things happen and I won't spoil the ending for you but it was a very enjoyable play. And the set was gorgeous! The fabrics they used were so pretty and they had really cute lanterns hanging from the ceiling. 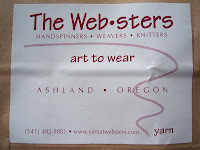 When I last went to Ashland I didn't know too much about yarn shops (I got most of my yarn from Michaels and the like) so I did not visit the yarn shop downtown. 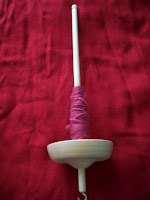 This time, I got to stop by The Websters and got my first drop spindle (and roving)! As you can see, I've already tried spinning. What's on the spindle is some wool roving from the store which I got 2 ounces of a pinkish color and 2 of a tealish color. 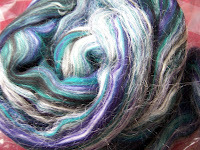 And then there's the lovely merino silk roving - I heart the colors! 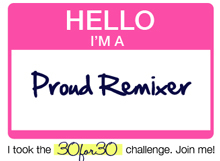 I'm afraid I will mess up whilst spinning...which is why I'm practicing on the less expensive wool stuff. So that will be all for now. I'm trying to finish a cross stitch piece for my aunt before she comes out to visit so I haven't been knitting/crocheting as much. And my internship is starting soon, then summer classes...I haven't had a real break yet! I'm sure I will make time for it somewhere.